Adrenalectomy is the surgical removal of one or both adrenal glands. The adrenal glands are paired endocrine glands—one located above each kidney—that produce hormones such as epinephrine, norepinephrine, androgens, estrogens, aldosterone, and cortisol. Adrenalectomy is usually performed by conventional (open) surgery; however, in selected patients, surgeons may use laparoscopy . With laparoscopy, adrenalectomy can be accomplished through four very small incisions. are usually neuroblastoma cancers. A successful procedure will aid in correcting hormone imbalances, and may also remove cancerous tumors before they invade other parts of the body. Occasionally, adrenalectomy may be recommended when hormones produced by the adrenal glands aggravate another condition such as breast cancer. Neuroblastoma is one of the few cancer types known to secrete hormones. It occurs most often in children, and it is the third most common cancer that occurs in children. In the united States, approximately 7.5% of the childhood cancers diagnosed in 2001 were neuroblastomas, affecting one in 80,000 to 100,000 children. Close to 50% of cases of neuroblastoma occur in children younger than two years old. The disease is sometimes present at birth, but is usually not noticed until later. Approximately one-third of neuroblastomas start in the adrenal glands. According to some reports, African-American children develop the disease at a slightly higher rate than Caucasian children (8.7 per million compared to 8.0 per million cases diagnosed). The surgeon may operate from any of four directions, depending on the exact problem and the patient's body type. In the anterior approach, the surgeon cuts into the abdominal wall. Usually the incision will be horizontal, just under the rib cage. If the surgeon intends to operate on only one of the adrenal glands, the incision will run under just the right or the left side of the rib cage. Sometimes a vertical incision in the middle of the abdomen provides a better approach, especially if both adrenal glands are involved. In the flank approach, the surgeon cuts into the patient's side. This is particularly useful in massively obese patients. If both glands need to be removed, the surgeon must remove one gland, repair the surgical wound, turn the patient onto the other side, and repeat the entire process. The last approach involves an incision into the chest cavity, either with or without part of the incision into the abdominal cavity. It is used when the surgeon anticipates a very large tumor, or if the surgeon needs to examine or remove nearby structures as well. This technique does not require the surgeon to open the body cavity. Instead, four small incisions (about 0.5 in [1.27 cm] diameter each) are made into a patient's flank, just under the rib cage. A laparoscope enabling the surgeon to visualize the inside of the abdominal cavity on a television monitor is placed through one of the incisions. The other incisions are for tubes that carry miniaturized versions of surgical tools. These tools are designed to be operated by manipulations that the surgeon makes outside the body. Most aspects of preparation are the same as in other major operations. In addition, hormone imbalances are often a major challenge. Whenever possible, physicians will try to correct hormone imbalances through medication in the days or weeks before surgery. Adrenal tumors may cause other problems such as hypertension or inadequate potassium in the blood, and these problems also should be resolved if possible before surgery is performed. Therefore, a patient may take specific medicines for days or weeks before surgery. Most adrenal tumors can be imaged very well with a CT scan or MRI, and benign tumors tend to look different on these tests than do cancerous tumors. Surgeons may order a CT scan, MRI, or scintigraphy (viewing of the location of a tiny amount of radioactive agent) to help locate exactly where the tumor is located. The day before surgery, patients will probably have an enema to clear the bowels. In patients with lung problems or clotting problems, physicians may advise special preparations. Patients stay in the hospital for various lengths of time after adrenalectomy. The longest hospital stays are required for open surgery using an anterior approach; hospital stays of about three days are indicated for open surgery using the posterior approach or for laparoscopic adrenalectomy. The special concern after adrenalectomy is the patient's hormone balance. There may be several sets of required lab tests to define hormone problems and monitor the results of drug treatment. In addition, blood pressure problems and infections are more common after removal of certain types of adrenal tumors. As with most open surgery, surgeons are also concerned about blood clots forming in the legs and traveling to the lungs (venous thromboembolism), bowel problems, and postoperative pain. With laparoscopic adrenalectomy, these problems are somewhat less prevalent, but they are still present. The risks of adrenalectomy include major hormone imbalances, caused by the underlying disease, the surgery, or both. These can include problems with healing, blood pressure fluctuations, and other metabolic problems. The outcome of an adrenalectomy depends on the condition for which it was performed. For example, in the case of hyperaldosteronism, the surgical removal of the adrenal glands provides excellent results, with the majority of patients being cured. In the case of patients diagnosed with pheochromocytoma, long-term cures are rare in cases of malignant pheochromocytomas. In cases of metastatic disease, five-year survival rates as high as 36% have been reported. There is wide agreement that laparoscopic approaches decrease operative morbidity. The laparoscopic approach is commonly used to treat smaller adrenal tumors. At many laparoscopic centers, the laparoscopic adrenalectomy has become the standard practice. Several centers recommend a particular approach or laparoscopic method, but regardless of which approach is preferred, the cure and morbidity rates are similar for laparoscopic and open adrenalectomy (in the case of small tumors). No method is suitable for all patients. In general, selecting the approach based on patient and tumor characteristics while considering the familiarity of the surgeon yields the best results. Alternatives to adrenalectomy depend on the medical condition underlying the decision to perform the surgery. In some cases, drug therapy may be considered as an alternative when the condition being treated in benign. Bradley, Edward L., III. The Patient's Guide to Surgery. Philadelphia: University of Pennsylvania Press, 1994. Fauci, Anthony S., et al., ed. Harrison's Principles of Internal Medicine. New York: McGraw-Hill, 1997. Little, M., and D. C. Garrell. The Endocrine System: The Healthy Body. New York: Chelsea House, 1990. Del Pizzo, J. J. "Transabdominal laparoscopic adrenalectomy." Current Urology Reports 4 (February 2003): 81–86. Desai, M. M., I. S. Gill, J. H. Kaouk, S. F. Matin, G. T. Sung, and E. L. Bravo. "Robotic-assisted laparoscopic adrenalectomy." Urology 60 (December 2002): 1104–1107. Hawn, M. T., D. Cook, C. Deveney, and B. C. Sheppard. "Quality of life after laparoscopic bilateral adrenalectomy for Cushing's disease." Surgery 132 (December 2002): 1068–1069. Ikeda, Y., H. Takami, G. Tajima, Y. Sasaki, J. Takayama, H. Kurihara, M. Niimi. "Laparoscopic partial adrenalectomy." Biomedical Pharmacotherapy 56 (2002) suppl.1: 126s–131s. Martinez, D. G. "Adrenalectomy for primary aldosteronism." Annals of Internal Medicine 138 (January 2003): 157–159. Munver, R., J. J. Del Pizzo, and R. E. Sosa. "Adrenal-preserving Minimally Invasive Surgery: The Role of Laparoscopic Partial Adrenalectomy, Cryosurgery, and Radiofrequency Ablation of the Adrenal Gland." Current Urology Reports 4 (February 2003): 87–92. American Association of Clinical Endoctrinologists. 1000 Riverside Ave., Suite 205, Jacksonville, FL 32204. (904) 353-7878. http://www.aace.com . "Laparoscopic Removal of the Adrenal Gland." 2001 [cited April 7, 2003]. 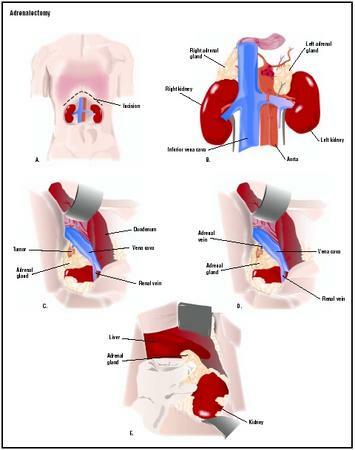 http://mininvasive.med.nyu.edu/urology/adrenalectomy.html . Richard H. Lampert Monique Laberge, Ph.D.
Adrenalectomies are performed by general or endocrine surgeons. Surgeons work closely with their medical colleagues (endocrinologists) who are often the doctors who are responsible for both the initial diagnosis and investigation of endocrine disorders. Endocrinologists may also be involved in long-term follow-up care after the adrenalectomy. Endocrine surgeons also work with nuclear medicine physicians, radiologists, pathologists, geneticists, and anesthetists to provide the best possible patient care. What procedure do you intend to use for my adrenalectomy? What do I need to know about my adrenalectomy? Why must my adrenal gland(s) be removed? What restrictions can I expect on my physical activity after the surgery? How many adrenalectomies do you perform each year? i am in the process of possibly going through this surgery and i've already had complications with previous surgeries. i have had blood clots that have traveled to the lungs and i have a filter put in and now removed to stop them from traveling further. i was wondering if there were other questions i should ask before they start the surgery. i go in on march 2nd to find out if i have to have the surgery in the first place. i'm also currently on coumadin, lovenox and two blood pressure medicines. that will probably make a difference. i also have asthma and allergies (not to any medications)again i don't know if that has anything to cause concern. removal of the left adrenal gland. After two months my bloodpresser is still high! I had my adrenal gland and tumor which was benign removed 4 weeks ago. My blood pressure went down within 2 days. I feel so much better. I am still sore but gettting around much better. I feel so much better. I am on 1 blood pressure medicine now. (Diovan) I go back for blood work on Sept 3 to check hormone level and other levels. I am so happy I decided to undergo this procedure. It worked for me. Since having my adrenal gland removed, I seem to be fatigued often. I also have high cortisol levels. Are there standard solutions for this? after the surgery of adrenalectomy (operated for right adrenal pheochromocytoma), after 4yrs of surgery does the kidney size reduce by 2to3 cms and gets malrotated, and their is excessive abdominal pain, what may be the reason and cure. i will be obliged if you send the reply. thanking you in anticipation and oblige. Doctors can not find why I have low Iron in my blood. A comment was made that Adrenalatoma might be the answer. After reading this article,I think that the cause of my problem could be that I have been on Prempro for 20 years. I went off of it for 2 month and the hot flashes were realy bad, so my Gyno said it is OK to go back on it. I have a appointment coming up with a Hemotologist in a few days. Last summer during my sigmoidectomy the pea sized adrenal tumor first noticed in 2009 had grown to being over 4.5cm. I will have my right adrenals removed (along with the tumor) tomorrow. Twelve hours from now I will be in surgery. Don't get old, don't get sick. This is my sixth hospitalization in twelve months. This may not be of consolation but it beats the alternative. removal of the left adrenal gland? I had a left adrenalectomy 23 years ago. Before the surgery my blood pressure was 220/120. After the surgery my blood pressure was normal again. I still have a long scar down my back. But I'm still alive for a reason. Stay positive everyone. I am a 24yr old female who is now living with adrenal insufficiency as of recently. I had a tumor on the right side of my adrenal gland the size of a tennis ball. i was in surgery for 6 hrs because the procedure went wrong and i ended up losing both my adrenal glands, because of that i will be on steroids for the rest of my life and every day is a struggle living with this chronic illness can any one relate???. Have a question - My husband had an open adrenalectomy and has one big incision (had surgery on Oct 2 2012) his incision is still very achy and like on his right side where they took the adrenal gland out is this normal for him to still have the achyness? He was on oxycodone for the first couple of weeks and ran out so they put him on hydrocodone he also will use tylenol a lot of the time. Please help me with this. I posted prior to my surgery back in October. I had my open adrenalectomy on my right abdomen on the 5th of this month. I met with my surgeon last Friday to remove my 31 staples and I was informed that the pain could last uptown 6 months with discomfort occasionally from here on out. I have been just trying to focus on the good and not the bad. Hoping most of my symptoms prior to surgery dissipate! I am having surgery on 12/20/12. I feel so alone. Iwish I had someone to talk to, so we could compare symptoms, and perhaps they could tell me I will be feeling much better after the surgery. To those of you who searched like me for someone to talk to who understands or can relate; I previously posted on here and got no response when I needed it the most and had nowhere else to turn. I am 3 wks into my recovery from my right open adrenalectomy. Turns out my mass was cystic measuring 10x8x3 cm and was not a pheo and was not the big C! I was a heart patient from birth to the age of 18 with a condition called Wolff Parkinsons White and apparently had this cystic mass for quite sometime as well as it had only grown approximately 1cm in 3yrs. I feel for those left in the dark who are full of questions and feel alone so I am reaching out to share my knowledge from my experience. I have decided to post my email publicly if any of you would like to talk. Night or day, if Im awake and available I will do my best to respond ASAP amlaw5386@gmail.com I will put the people in this forum in my prayers and hope I can be of help or just a listening ear! I had my right adrenal gland removed on 13/12/12-thank goodness it was a non-malignant pheo. I have recovered well and as far as I know my blood pressure is pretty normal however, this has not been monitored by anyone over the last year. My problem is I am still suffering different amounts of pain/stabbing pains which seems to be inside where the op was carried out. I am worried that this is still happening as no one has told me otherwise! Can anyone please give me some feedback as I feel that I am moaning about it to much (others just don't seem to understand). Hello, I am having surgery on 2-25-13. Tumor on right gland and less than 3mm. Call me superficial, but I am so worried about scarring. My surgeon informed me that he planned a laparoscopic procedure, but would perform an open surgery (old school cut) if he runs into problems or if I bleed heavily. This worries me so much. So far, scans seem to show that the tumor is benign. I am also concerned about pain from the procedure and if there is a difference in hair texture or hair loss after surgery or does hair grow back after any hair loss. Please share your experience on changes in hair/hair loss and regrowth as well as any overall change you've noticed after surgery. Hi Laura, thanks so much for responding. I too have thick hair and it's not that obvious. I just wanted hope that it would bounce back. My surgery went well. It was done laparoscopically without problems. I can't even say I had pain, other than a swollen tongue from the trach. However, I am quite concerned that my BP remains high at this time. Immediately after surgery, my BP fell nicely and remained nearly normal for hours and days after surgery. Now, two weeks out, it is back in the high range 174/111 (with Diovan 320mg). I am hoping that my body is just adjusting and hopefully my left adrenal gland will awaken and respond. Overall, the surgery is so worth it and I believe the moral of the story is that all things will take time. Hello. Have never thought of sharing my experience of my adrenalectomy before but stumbled on this site when doing research for a book I am writing. I would be interested to hear what symptoms people have had if they have had a pheo and how easy they found it to get their GP/Dr to take them seriously. It took me what they believe was as long as 7 years and for me to go into respiratory arrest before my tumour was identified and I had been in hospital for a month in a coma when eventually it was identified. I would be most interested to hear other peoples experiences. My op was in 2009 and I still go for my follow up appointments every 6 months and have my catecholamine levels checked. Not wanting to depress anyone, but I had open surgery and I suffer dreadful scar pain to this day. Love to hear from you all. Hi there - I had a 4cm tumor on my left adrenal gland removed in July of 2005. I was close to death at one point, because in the recovery room I was found to have a blood hemorrage pouring out of my frontal wound, which caused them to have to open me up for the secnd time. The Dr discovered my spleen was ruptured and believed that she did not want to remove my spleen as well as my left adrenal gland and put her hands around my spleen until the spleen stopped bleeding. It worked!!! However, I had lost 4 units of blood by then and I woke up in ICU a very sick girl. I was in ICU for four days and then moved to a regular room. I went home on the eighth day - was home for a week with two drains coming out of me - one for the spleen and one for the incision. Unbeknown to me, i had a bowel blockage forming and was put back in the hospital, had a tube down my nose to empty my stomach and thank God it cleared up partially because my surgen had done a CT Scan and she believed that the fluid they have you swallow pushed the bowel back open. Since this time, however, I have had 5 hernia surgeries, one which was serious, as the hernia was starting to wrap around my large colon - oh my - i sound like a mess, huh? But God is good and thru it all I have had good Drs. I don't care much that I have a lot of scars - I'm thankful to still be here and that I did not have cancer, as my tumor was benign. I take a minimum amount of cortizone 5mg daily - but I do have times when I need more. Getting to understand my body and its need for medication is a challenge for me. I have had a time in the ER to have a bolus of medication given Iv - and most of the time when i feel really nauseous and know I am going to throw up, I find if I can pop about 10 additional pills of 5mg cortizone I can then stop the shortage in my body of cortisol. If there is anything I can share further to help anyone, I would certainly do this. Thank you to those who read this. I am having my right hand adrenal tumor 7cm removed 8th August I beleive they are going to remove key hole I would like to know what are the chances of this changing to open surgery? How often would this happen? Angela, I think there are many reasons it is so difficult to find and treat people with adrenal problems. One is that the symptoms are all rather vague. Also, doctors (particularly specialist) tend to look at symptoms in isolation rather than the whole person as a group of symptoms. They assume many women just have hormonal problems or depression, but rarely try to find the cause of these hormonal problems or depression. Many of these symptoms can be related to the adrenal glands. Many women suffer from adrenal fatigue without even knowing it. I have been treated for thyroid and adrenal problems for years. Eventually, extreme symptoms appeared and got worse very quickly. I have experienced nausea, loss of appetite, several episodes of extreme pain in by abdomen near my rib cage (felt just like labor pains and last for 12 hours each time), 30 minutes after eating I start sweating and my face gets flushed, in general I am sweating excessively and my perspiration smells really bad compared to normal, my sleep is disrupted and the chemical reaction that occurs when we go to sleep is affected which is causing me to get a surge right as I am falling to sleep that prevents sleep from occurring (so I am unable to sleep), I have episodes where my vision is blurry and there are days when I cannot even see the TV much less read or drive, the fatigue is overwhelming and affects my mental acuity, I suffer brain fog and forgetfulness, my menstrual periods stopped abruptly (though my gynecologist said I was not in menopause), my belly often gets bloated and extended when I eat (even if it is something simple like a salad), I get soreness and achiness in my heart area, I have severe pain in my joints that started in my hands and elbows but has now spread to my legs (this is especially severe in the morning), my head was very itchy with a rash, I had episodes where I lost hair at an alarming rate, I have had more infections (like sinus infections, urinary tract infections, etc. ), my energy level is depleted (used to swim 2-3 times a week but now have difficult just doing the laundry),etc. before I attempt surgery. The more informed I have, the better decision I can make. P.S. a lot of doctors do not pay attention to scar treatment. I have numerous scars on my body and I can tell you from experience you must treat your scars or they will harden and stay red. I highly recommend “Palmer’s Coconut Butter Formula with vitamin E” in the tub not the lotion. You can get it at Walmart or any drug store. I use a q-tip and scoop out the butter and rub it on my scar 1-3 times a day (when you get up and go to bed is fine). It helps keep your scar soft and pliable and helps fade the color of the scar. It is very beneficial for all the scars I have. The coconut butter softens it and the vitamin e will help it fade and heal it. All my tests were normal (though I was being treated for thyroid and adrenal dysfunction, so it might have masked any problems). I normally have low blood pressure, so it did not register as being high even though it was high for me. The CAT scan, the blood tests, the urine test, and the ultrasound were all normal. I went to a gastroenterologist and he could not find anything wrong with me and suggested I had psychological problems since all the tests were normal. I finally had an endoscopy that found the adrenal lesion on my left adrenal gland that was 25mmx28mm. The gastroenterologist didn’t think this was significant and referred me to a neurologist, because of the blurred vision (he didn’t think my whole list of symptoms was significant). I even pointed out the results of the endoscopy that showed the adrenal gland cyst and he did not think it was significant nor did he think it was the cause of my symptoms. So he was ready to believe I was hormonal and depressed, but would not believe the adrenal gland cyst had anything to do with it. Really!?!? !I did my own research and found the adrenal gland cysts could cause every single symptom I was having including blurred vision. I saw my regular doctor and asked to see an experienced endocrinologist. There are very few doctors that specialize in adrenal glands since these type cysts and tumors are so rare. A friend of mine referred me to a hospital near him in Missouri that does specialize in adrenal glands and tumors. I have asked to be referred there so I can see an experienced doctor. I do not want a regular endocrinologist to see me, but think it is best to seek out someone who deals with this on a regular basis. The adrenal glands are the motor that runs all the major systems in the body and after surgery or treatment you will need to be regulated and monitored for a while until all your systems are regulated again. Be your own advocate. I highly suggest people avoid blindly listening to doctors, particularly if you feel they are not taking you seriously. I have always said, no matter how intelligent a doctor is, no matter how educated a doctor is, no matter how experienced a doctor is, they will NEVER be an expert on my body. I am. Use the internet and books to check things out. Make a list of every single symptom you are having whether you think it is relevant or not. Make a list of every test you take and every doctor you see. I put all of these lists on the computer so I can easily add to them and can copy them when I need to. Get copies of every single test result and read them yourself. It is amazing what things show up in testing that doctors overlook or refuse to consider significant. I just know without a doubt that the adrenal gland cyst is what is causing my symptoms. I am making sure I know everything I possibly can before agreeing to treatment or before being referred to another “specialist”. Women in particular need to educate themselves on how the thyroid and adrenal glands affect their hormones and ability to function. A good resource for information about the adrenal gland is “Adrenal Fatigue: The 21st century syndrome” by James Wilson, and “Living Well with Hypothyroidism” by Mary Shomon. Every woman who has been told “you are just hormonal or depressed” needs to read these books, though men can benefit as well. Stress affects the way your adrenal glands work which in turn affects all your other systems. It can be psychological stress, emotional stress, intellectual stress, or physical stress, but whatever the kind of stress it is it will affect the adrenal glands. I found my initial symptoms were not very severe and were somewhat vague. I didn’t know what to tell my doctors, but I knew something odd and different was going on with my body. Doctors like to blame everything on the medication you are taking, your hormonal state, you emotional state, your eating habits, your work habits, etc., but you know your body well enough to know it is not any of those things. As time went on, my symptoms became more severe and then more symptoms appeared. I am glad to read about other’s experiences before I attempt surgery. The more informed I have, the better decision I can make. I had my surgery on May 19 2012 it went well they found the tumor looking to see if I had a hernia from a prior surgery so I was very lucky I was just wanting to know does any one have pain I hurt and it's been 4 months and I'm hurting more now I knew I would from the surgery but this is just like it was before I had always thought the pain I had was from my gallbladder and the docteor said it was from the tumor so now what? I am a slim, healthy (overactive) sporty 34 year old. During 2008, my blood pressure increased from 120/80 to 170/130. There was a family trauma at the time which may or may not be related to this. It took 3 years of cardiological testing for my local hospital to refer me to the Endocrinology department, where I was soon suspected of Hyperaldosteronism. I was initially taking one drug to control my bp, but laterly found a combination of 20mg Ramipril, 10mg of Lercanidipine, and 2-6 potassium supplements a day worked for me - just about. As with many people with this condition, I suffered from a bout of depression and took medication for a short spell which helped to settle my mind. All through this time in my life I have been concerned with the time it took to get a diagnosis which is very common for anyone who is unwell. I was then transferred 18 months ago to a specialist hospital (Addenbrookes, Cambridge, UK) where I had Adrenal vein sampling (twice) and a special CT scan with a radioactive substance in my body to determine which gland was causing my problems. It was revealed during April 2013 that I had a tumour in my left gland 17x10x8mm, so in June 2013 I had laproscopic Adrenalectomy. My bp dropped drastically post op, and settled within 5 days to 95/65. My potassium level also stabilised in this time. I do not take any medication now. Being young, fit, slim and healthy, I had no idea how badly my body would react to the surgery. I do not wish to alarm anybody, but it seems to be the case that the slimmer you are the harder you will bounce back. The surgery went well, but I changed from being 100% overactive to 5% function post op. For the first 4 days I could not talk easily due to weak lungs, my walking was pure comedy as I was shuffling and was bent double like a pensioner, which was quite amusing in my local drs surgery when visited for a blood test 4 days post op, I was the youngest person there! I couldn't lay flat or sit upright for more than 10 minutes at a time for the first 2 weeks. My pain was controlled by painkillers quite well. Every day I would rest on the sofa and was very lucky to stay with family who helped with my recovery. After 4 weeks I could slowly walk for a maximum of 30 minutes in one go, but would spend many hours afterwards resting. I tried to go back to work after 7 weeks, I work outside so this was far more challenging than sitting at a desk, and could manage mornings but would have to rest everyday once I got home. It has been nearly 5 months post op now, and I am finally starting to feel better. My blood pressure would fluctuate from the lowest reading of 75/49 - 100/70 over the first few months. When it was very low I was numb with fatigue, but gradually it has increased. I still get very tired and most of the time I have bags under my eyes. I have circulation problems now but I can see this makes sense after such a change in bp. I have bought warm boots and gloves ready for the winter months ahead. I have met a few people who have struggled after surgery, but nobody mentioned this might be the case beforehand. I now realised any surgery is a huge invasion for the body and many people say it is 6-12 months before they feel normal again. I also have vertical ridges on all of my fingernails which is what brought me onto this site today. I hope my experience will be useful to anyone who is going through the same condition, and most importantly of all, I AM starting to feel better. Does anyone know about having a double adrenal removal surgery ? How long will I be in the hospital recovering ? Thanks You. I had an adrenalectomy (right kidney) in January 2015. I am concerned because it has been 6 months since surgery and I still have the same pain under my right ribcage and I am always tired. I am also still battling with my hair falling out and weak nails. In addition I get the most terrible night sweats! Has anybody else experienced these symptoms? How long does it take before the pain finally goes away? My surgeon assures me that there is nothing to worry about but the pain really worries me. I have been operated of right adernal gland approx 13cmx 10 cm length pheochromocytoma dt 07/07/2015 in Medanta gurgaon by Dr Manav Shuryanshi. Now my Bp is under control . But pain' stifness & wekness is continue in the incision area. how long it will continue ? Thank you for not making me not feeling alone I am a 53 year old male with malignant hypertension. I have been on blood pressure since I was 16 years old. Currently 18 BP pills x4 a day no luck my endocrinologist is ordering a MIBG scan but more than likely she is making a referral for surgery and a open exploratory laparotomy all test except 24 urine and blood show positive but I can not have an MRI due to metal in my back. Has anyone seen this before and thank you once again. Had left adrenal gland removed on 9-20-16. Only side affect sweating started in hospital after surgery. Told to drink plenty of water body had to adjust. Had left adrenal gland removed 23.05.17. because it was over producing cortisol, this was only discovered during a routine MRI for another problem ( the gland wasn't causing me any problems). Had some strange side effects. Side effects slowly fading but still having terrible hot flushes. On 30mg steroid daily. Consultants not very informative. Does anyone know will my flushes increase if I try to cut down on steroids?? Had a left adrenalectomy and post surgery while my blood pressure medications have been reduced from 4 to 2, I am now experiencing hot flashes and night sweats. Has anyone experienced the same thing? I hope everyone is coping okay with their situations, it's been quite emotional reading everyone's posts and my good wishes go out to every one of you. I had my pheo removed by open adrenalectomy over 30 years ago and consider myself incredibly lucky to have had it diagnosed. I wanted to know if anyone is suffering with anxiety with one adrenal gland as I am not coping with confrontation at work. I tend to just start 'shutting down' when put into stressful situations and cannot stand up for myself like I used to. Is any one else suffering like this? Hello..I am suffering from high BP 150/160 to 110 and high heart beat 100 to 120. CT scan detects left adrenal gland adenomas measuring size 0.9 and 1 cm in left adrenal gland..Huge side effects facing like very hard to walk..Always diziness..Always Restlessness..fainting situation..Hard to see and concentration..Pls help me...Any advice...I am from Kolkata...My doctor saying ur tumor not secrets any hormone..
My question then if my tumor is not functioning then why I am facing these so many side effects?? Any valuable advice is required. My daughter who is 21 is scheduled to have an adrenalectomy on January 16, 2019. She is having the surgery because she has a 5.1 cm pheochromocytoma on her left adrenal. We are concerned because we think her doctor has never performed this type of surgery. She is also a college student and he said she cannot return to school for 2 weeks. We are now worried that she will have take a medical leave from school. The doctor seems to think this surgery is not really a big deal. The doctor plans to use robotic surgery and make 5 incisions in the abdomen. I am wondering if we should cancel the surgery and find a different doctor.